This slow cooker beef and black bean chili is likely the easiest chili you’ll ever make. Just toss beef chuck, black beans, tomato puree, onion, garlic, and chili powder into your slow cooker and walk away. Perfect for Super bowl or simply stashing in the freezer. 1. Place the beans in a large bowl or pot, add enough water to cover with several inches of water, and refrigerate, covered, overnight. (Alternatively, to quick soak the beans, place them in a large saucepan and cover them with water. Bring to a boil and immediately remove from the heat. Let stand, covered, for 1 hour.) Drain the beans. 2. 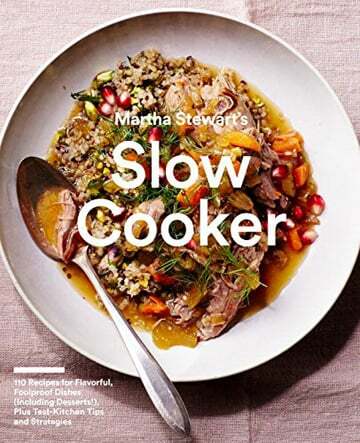 Preheat a 5-to 6-quart slow cooker on low until warm. 3. To the slow cooker, add the drained beans, beef, tomato puree, onion (reserve 1 tablespoon for garnish), garlic, chili powder, the hot water, 2 teaspoons salt, and 1/2 teaspoon black pepper and stir to combine. Cover and cook until the chili has thickened and the beans are tender, about 6 hours on high or 8 hours on low. 4. Serve topped with sour cream, reserved onion, jalapeño, avocado, and cheese. 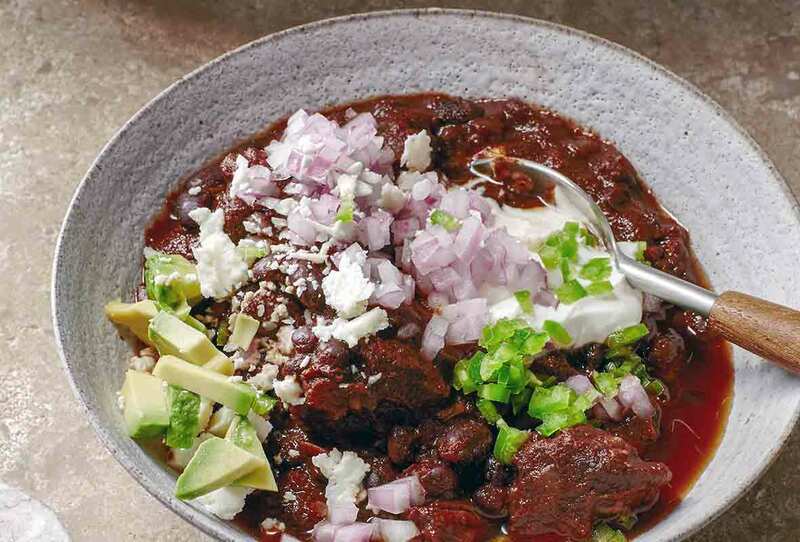 Slow Cooker Beef and Black Bean Chili Recipe © 2017 Editors of Martha Stewart Living. Photo © 2017 Stephen Kent Johnson. All rights reserved. All recipes and photos used with permission of the publisher. Oh, that’s good chili, different from our usual but very good, and very easy with no fussing. A quick overnight soak of the beans and then everything went into the slow cooker. I gave it a stir and 6 hours later we had a competition-worthy chili. The beans and the beef were both tender. I took off the lid and let it cook a little longer to thicken the chili a little. We enjoyed the flavors so much we forgot to put on any toppings. There were only the two of us so we’re looking forward to the leftovers tomorrow. This is a GREAT high-quality chili recipe for any chili lover. All in all, the recipe took just about 6 hours on low in my 6-quart cooker. I ended up with about 6 normal servings of this LUSCIOUS, dark, rustic affair or, in my case, 4 awesome fat guy servings. On its own, this chili is hearty but it’s really a blank canvas, making it ideal for everyone at the table to make it their very own. One could easily add exotic hot sauces, spices, peppers or, most anything that will calm the inner beast. I will certainly make this again. GREAT STUFF!